The Society's collections of annuals, also known as gift books or literary annuals, contains over 1,600 examples published in the United States between 1820 and 1876. These books arrived in force upon the American publishing scene in the mid-1820s. They were compilations of fiction and poetry, often of a sentimental or religious nature, frequently illustrated and usually handsomely bound. Among the writers who contributed their poems, stories, and essays were William Cullen Bryant, Lydia Maria Child, Ralph Waldo Emerson, Edward Everett, William Lloyd Garrison, Nathaniel Hawthorne, Oliver Wendell Holmes, Washington Irving, Henry Wadsworth Longfellow, James Russell Lowell, Frances S. Osgood, Theodore Parker, Edgar Allan Poe, Lydia H. Sigourney, John Greenleaf Whittier, and Nathaniel Parker Willis. Many of annuals came to AAS as part of notable American bindings collections, assembled by Michael Papantonio and Kenneth G. Leach. Of particular interest are the steel engravings that illustrate the early literary annuals. They reproduce paintings, drawings, and watercolors by America's artists including Thomas Doughty, Alvan Fisher, William Sidney Mount, George Loring Brown, and William Guy Wall. A significant number of the illustrations reproduced works by European artists of the Renaissance and later eras and served to make the works of these artists known to a portion of the American public. Each engraving in the annuals collection has been individually cataloged and digitized as part of AAS's Prints in the Parlor project. The annuals collection is fully cataloged online in the General Catalog using the genre term gift books. Faxon, Frederick W. Literary Annuals and Gift Books: A Bibliography, 1823-1903. 1912. Reprint. Pinner, U.K.: Private Libraries Association, 1973. Kirkham, E. Bruce, and John W. Fink, comps. Indices to American Literary Annuals and Gift Books, 1825-1865. New Haven, Conn.: Research Publications, 1975. Includes full tables of contents and lists of illustrations from the almost five hundred titles listed in Thompson’s bibliography, with author, engraver, title, and other indexes. Thompson, Ralph. 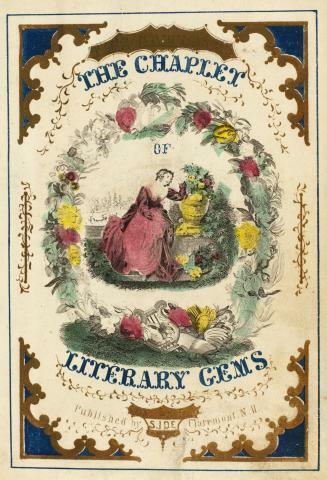 American Literary Annuals & Gift Books, 1825-1865. 1936. Reprint. Hamden, Conn.: Archon Books, 1967.